Alice Atkinson, known as Blanche, was born to Frederick John Atkinson and Mary Ann Martha Church on 5 July 1879 at Crafers, South Australia. She trained as a nurse at the Adelaide Hospital and worked for several years in Western Australia. During the First World War, Atkinson went to England to join the nursing branch of the British Army, known as Queen Alexandra’s Imperial Military Nursing Service. She embarked from Adelaide on the SS Beltana and arrived in London on 22 July 1915. Atkinson was posted to the Brockenhurst Military hospital in August 1915 where she worked until her admittance as a patient at the hospital, in March 1916, suffering with a severe cough and chest trouble. She was found to have contracted tuberculosis. Atkinson was discharged medically unfit a week later. In June 1916 Atkinson was moved to the Royal Victoria Hospital, Netley. While in hospital, Atkinson was awarded the Royal Red Cross medal for her devoted service. In August 1916 Atkinson was well enough to travel back to Australia and left England on the HT Marathon, arriving in Australia 23 September 1916. Atkinson returned to Crafers, but did not recover from the illness. She died 9 December 1916, aged 37 years. 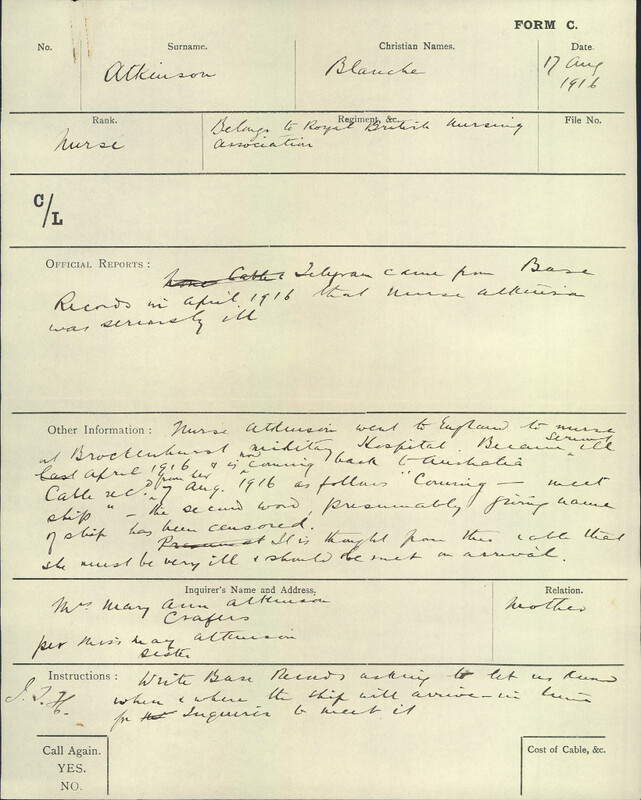 One of the few nurses to appear in the records of the South Australian Red Cross Information Bureau, the contents of Atkinson’s packet document the confusion about when and by which ship she would be returning to Australia. Atkinson’s mother had received cable about her arrival in which the name of the ship had been censored. Considering Atkinson’s ill health, her mother was anxious to meet her on arrival. It is not clear from the records in the packet whether she obtained the necessary information to do so.